The 5th annual Postgraduate Conference was held on 31st October 2015 at the Cockcroft Institute (CI). This conference is an important event for all CI postgraduates and it provides a platform for them to networking, sharing information and practising their presentation skills. More than 40 postgraduates and academics including 9 students from the University of Strathclyde attended the conference. CI Director, Prof. Peter Ratoff gave an opening speech. He welcomed all the participants and introduced the latest news about the institute. It was then followed by 18 presentations covering a wide variety of research activities going on in the institute. A judging committee made up of lecturers and senior ASTeC staff marked each presentation based on their presentation style, technical contents, research context and question handling etc. The overall quality of the presentations was very high. 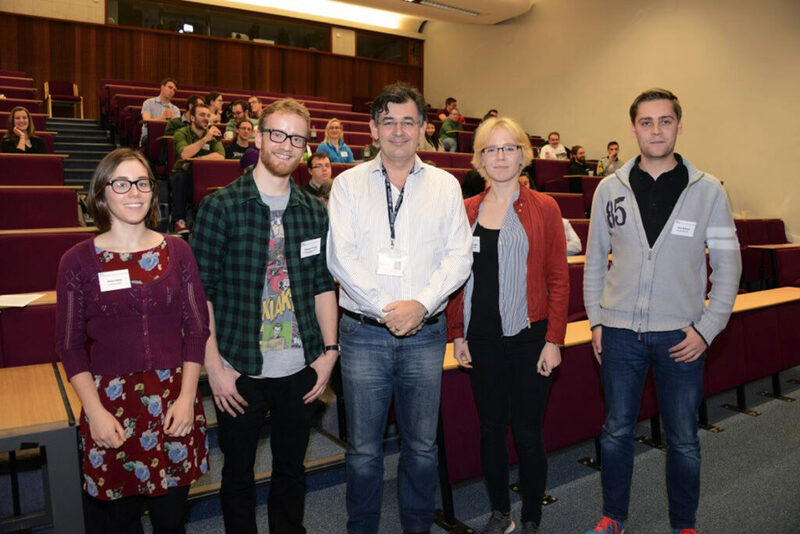 Finally the first prizes were given to Agnese Lagzda (Radiotherapy studies on very-high energy electrons, a potential new paradigm in radiotherapy treatment) and Thomas Pacey (Designing tunable dielectric wakefield accelerators) from the University of Manchester. The second prize went to Paul Scherkl (Inverse Thomson scattering from plasma wakefield accelerated electron beams) from University of Strathclyde. The third prize was received by Alisa Healy (Dielectric-lined waveguides for Terahertz-driven electron manipulation) from the Lancaster University. Well done and congratulations! CI Director, Prof. Peter Ratoff and the prize-winners.